Yisrael Harel, the founder of the Yesha council and a columnist for Haaretz, called on Jewish Home party chairman Rabbi Rafi Peretz to add the Otzma Yehudit faction to the joint list between the Jewish Home and National Union parties. "I hear the voices of hesitation and I say: Dear friends, in an election campaign we should be not only right, but wise. Our opponents do not make such calculations, and we should not be 'more Catholic than the Pope.' We should think like politicians and enter the Knesset with strength. 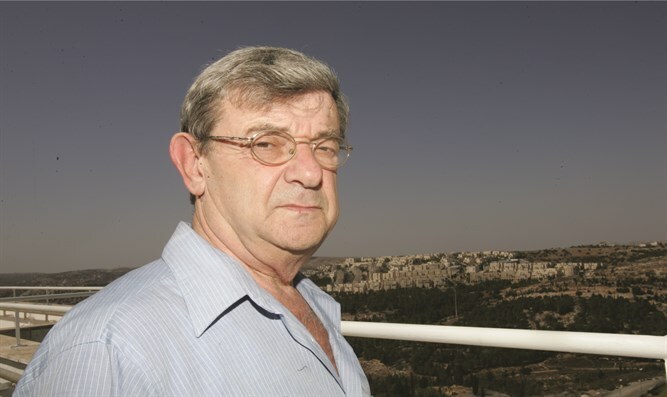 Then we can return to a more precise ideology," Harel told Arutz Sheva. According to Harel, religious Zionism requires Otzma Yehudit to achieve a significant victory in the upcoming elections. "The danger of being utterly powerless is behind us, but it would be a waste if two and half seats [worth of votes] were lost. Therefore, a joint list with Otzma Yehudit and the New Right as a technical block in the negotiations with the Likud will yield thirteen or fourteen seats that will have tremendous power, which means that the Ministry of Defense and the Ministry of Justice can be in our hands, as well as other high-ranking positions." "This way, it will be possible to prepare for the Likud network, despite the fact that quite impressive people have been elected to it. Their ideological infrastructure is eroding and religious Zionism, which broadcasts entirely different things, can prepare itself to be the heir," he said. Harel slammed those who called for the disqualification of Otzma Yehudit. "Those who demand that we disqualify them do not rule out close ties with the extreme left. And the extreme left that attacks us for allegedly forgiving Otma Yehudit does not refrain from meeting with Abbas, who has a picture of Arafat on his wall, and he also funds the murderers who slaughter us and pay them salaries. The hypocrisy on this matter is very, very large, and therefore I think it is necessary to run together with Otzma Yehudit." Harel said that he also has problems with statements that have come from Otzma Yehudit. "It's hard for me because some of them are infected with hatred for another people and not out of ideology. I can understand ideologically the fear that one day the Arabs will be a majority here and want to inherit the land, and therefore we have to think wisely about what will be with them. But this cannot be out of sheer hatred. It must be rational thinking about how to preserve the Jewish majority in the State of Israel. I also find it hard to accept the ideology of this hatred, even though I also think that the foreigner should not be part of our national identity. Therefore, we did not introduce equality for the Arabs in the Nationality Law because we said that it is a Jewish state and therefore the Jewish nationality is the one that is expressed." However, he dismissed claims that Otzma Yehudit will be disqualified from running by the Supreme Court. I don't believe that the Supreme Court will dare to disqualify this list. If it dares to disqualify this list, then it must also disqualify the Arab lists. I also know Itamar Ben-Gvir and Baruch Marzel. They are smart and intelligent, and in their platform there will be no grounds for disqualification." While he believes it is imperative for the Jewish Home to join with Otzma Yehudit, he does not feel that there would be much to gain by joining with Eli Yishai's Yachad party. "I think that Yachad is a bluff. Eli Yishai is a good man and worthy of politics, but he goes into his corner and does not make any difference either way in electoral terms. And ideologically he is also a Shas man who went fishing in other waters, so I certainly do not suggest placing him [in a high rank on the Jewish Home list] at the expense of someone else who is more worthy and talented.